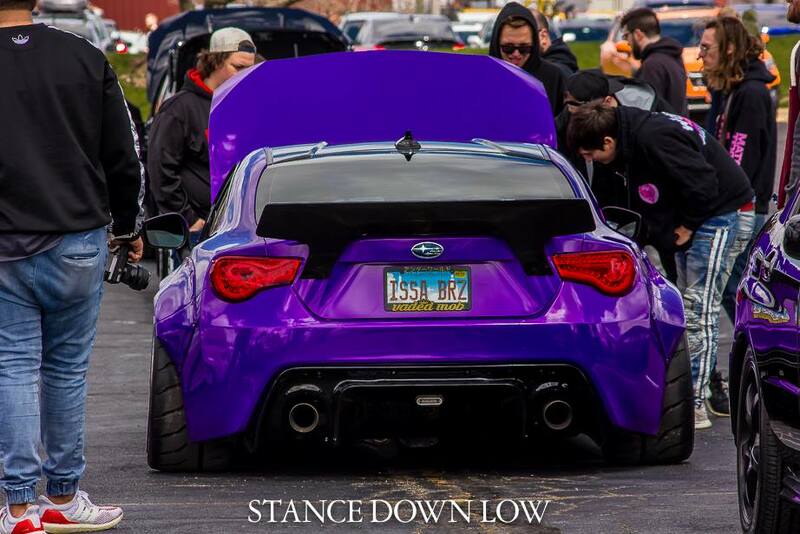 In case you missed it, the Chitown Subarus Big Meet was held on April 28th. We drew a record crowd at the DeVry campus in Addison, IL. Over 650 Subarus, 1,000 people and 50 dogs gathered together to start the season off right! Special guests, VIP and car show participants arrived early. We had some enthusiastic members show up early too, and in no time the lot started filling up with Subarus! 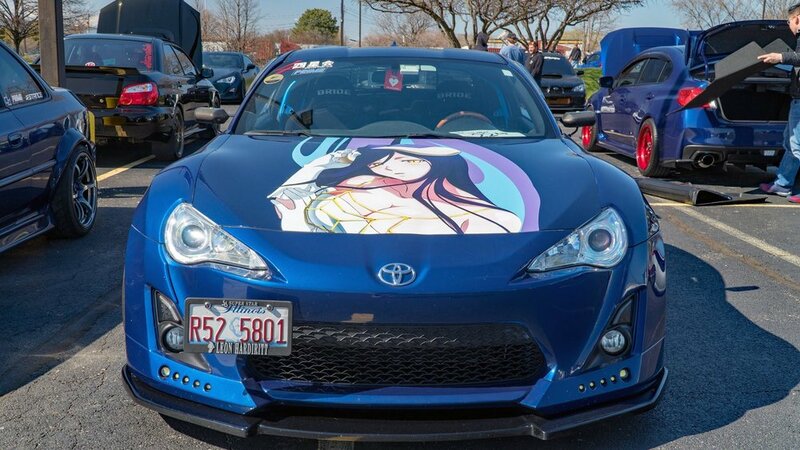 In addition to hundreds of Chitown Subarus members, the Big Meet gathered Subaru clubs from around Chicago and surrounding states. 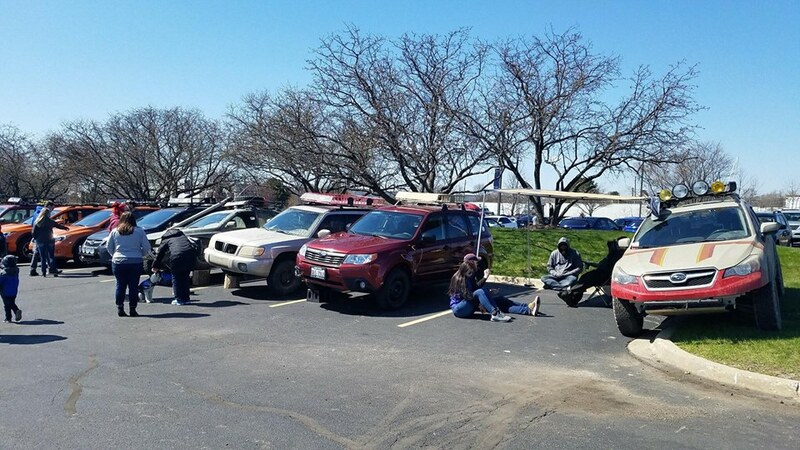 Car clubs in attendance included MtnRoo Midwest, Northwest Indiana Subaru Owners (NWISO), South Side Subarus, Fl4t Society, Chitown 86, Chitown Foresters, Gateway Subies, and more. Many attendees were members of multiple groups. Once parked, members could roam the expansive lot to check out all the cars and clubs, but many quickly made their way to the CTS tent. The merchandise table was packed all day! It was a joy to see so many members wanting to show off their Chitown Subarus pride. Shirts and stickers were the hot items. Hats and lanyards were available in limited qualities. Two handmade blankets were for sale too. 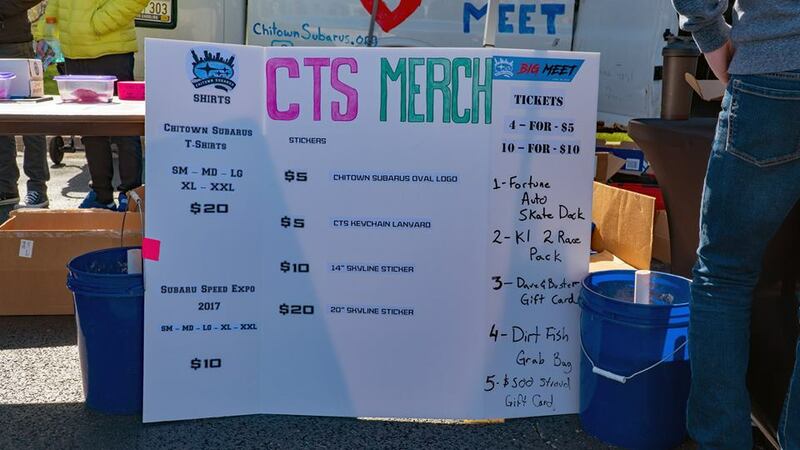 Next to the group tent was a raffle drawing, stocked with some really cool items donated by our generous sponsors. The raffle table was made possible by Dave and Busters, DirtFish, Fortune Auto, K1 Speed, and Stroud Built. In short, the day was filled with making new friends and catching up with old ones. In case members got hungry, we had a food truck on site. The line for The Cookout on Wheels was long all day. Too long. The food truck sold out of most of their menu! 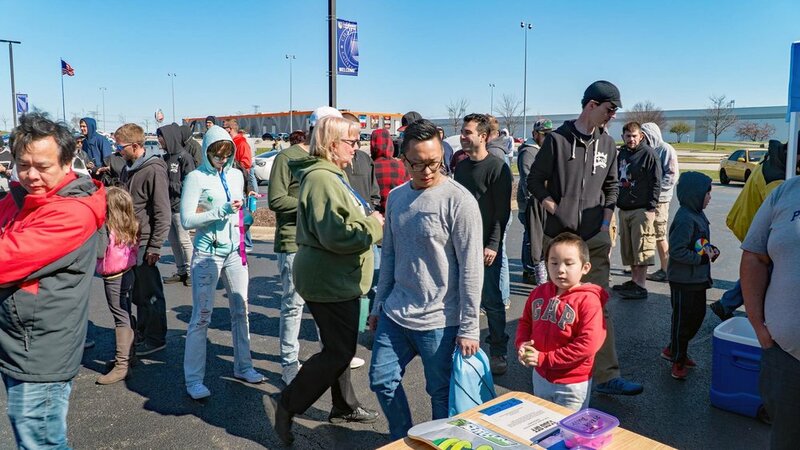 We planned for 400 cars and 600+ showed up. In short, we could have used another food truck. The successful day ended with the raffle drawing. In the end, everything ran smoothly. From all of the admins of Chitown Subarus, I'd like to say thank you to everyone who attended (especially our sponsors), DeVry University for graciously hosting us, and the Addison Police and Fire Departments. It was a pleasure to put on this event. We look forward to doing it even bigger and better next year! Here's to many more years of bringing the community together. As 2017 comes to a close let's take a look back on the past year, all of the new friends and the memories we've made together! 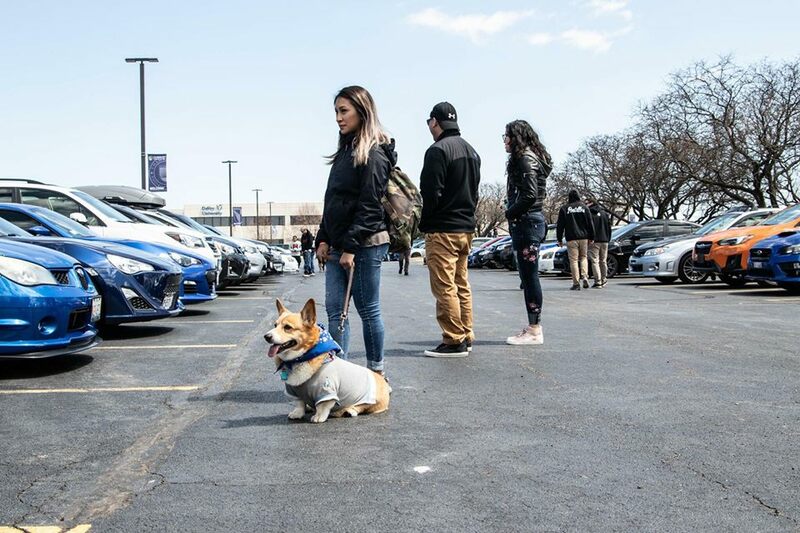 We are looking forward to an even bigger and better 2018 so you'll definitely want to add "Go to Chitown Subarus meets!" to your new year resolution list!!! Chitown Subarus Winter Karting League Off to a Fast Start! Monday evening marked the start of the third annual season of winter karting events for CTS. This year an exciting new twist has been added, a points series to crown a season champion. The event drew a crowd of enthusiastic Subaru owners and their friends to the K1 Speed location in Addison. Once everyone arrived, run groups were set up with the K1 staff. Then people who were interested signed up for the championship and participants were given custom event stickers to adorn their helmets. With the paperwork out of the way it was then time to race! For the racing everyone drove together, both people competing in the championship as well as those who were there just to have a good time. As has become tradition the event consisted of 3 races for every participant. As a result of attendance there were multiple run groups which have everyone time to watch their fellow competitors drive as well as chat about strategy and everything else that gets discussed at a typical car meet. After the dust settled, times were collected and the winners were crowned. This was made easier since CTS members set the fastest times of the week on that track therefore K1 did most of the work for us. This event's winner was Allan S, but the competition was fierce with all 10 championship competitors within a half a second of one another! As for the championship, six events are planned, points will be F1 style and based on competitors fastest lap of the day. In order to help accommodate members busy schedules the lowest 2 event scores will be dropped. Our next event will be held on December fourth as the same Addison K1 location, but on other track. This past Saturday, Chitown Subarus took a cruise up to Illinois Beach State Park in Zion, IL for our annual BBQ meet. The cruise saw dozens of cars make the trip from our Schaumburg meet location all the way up I-94 to the beach front. We had over 200 cars show up with their friends and families enjoying the perfect weather. Grill master Mike Foss was making sure everyone was well fed from all of the food that everyone brought to our potluck. We had raffles, volleyball and a few games of bags going on thoughout the entire afternoon. Member Tony Cataldo put together a video highlighting some of the rides that were in the parking lot. Mike Foss also took video with his drone of the entire event. Today we are happy to announce our completely overhauled Chitown Subarus website! While CTS has grown into something that even dwarfs what it was a year ago, we wanted our website to better reflect who we are as a group, offer a more visual experience, and make navigation on mobile devices easier. We feel that this website refresh accomplished all of these goals, as well as give us the ability to make changes or improvements to the site as we continue to grow. Other improvements to the site include the ability to perform a site wide search, the new high-level "Editorials" link that breaks out user submitted content like Behind The Wheel, Under Warranty and future columns to make them easier to read, and neat animated banners. To celebrate the occasion, Tim Tannhauser and his 2004 Forester will highlight the new-look YOHB, which will also be changing to once a month instead of bi-weekly. You can read about Tim and his car here. In the coming weeks, we will unveil our new storefront with new products, but for now, please take a look around and let us know if there's anything missing! We hope you enjoy it!